Sometimes we are blessed to be loved unconditionally by people who aren’t related to us by blood, or joined to us by law. Over Christmas, My Good Man and I were privileged to stay in the home of two such people who have taken us into their hearts and called us “family”. Waking when the sun hit my eyes, I rose to prowl around the house, camera in hand, and began to notice what I have taken for granted for years: how thoroughly infused into their lives I have been. This is the most familiar and comfortable of my families’ homes, and there are signs everywhere that I belong: from the photos I’ve taken of them, which are displayed with other beloved snapshots in every room, to artistic shots printed large and hung on the walls, and various gifts presented over the years. There is even a photo from our wedding displayed on the wall alongside other family portraits. Generous gatherers of life’s flotsam and jetsam, there are all manner of tiny trinkets and tokens of lives lived unreservedly on display throughout their home. Many of these things were frogs, cars, and Doctor Who ephemera – how could I not love that? And most importantly, I love the people who care enough to collect these memories, and include me in them. Please click on the image to view at full size. I was admiring the recent black and white work of a photographer friend, which was taken using her camera’s monochrome setting, and resolved to take my camera out on a monochrome adventure. So this afternoon I drove across to a neighbouring town to find a church My Good Man had suggested might be a good subject. I decided to set my Olympus to spot metering, which I’ve not used before, and took a couple of shots. Returning home, I was disappointed with the photos, so jigged a couple – just slightly – using Pixl-r-omatic. 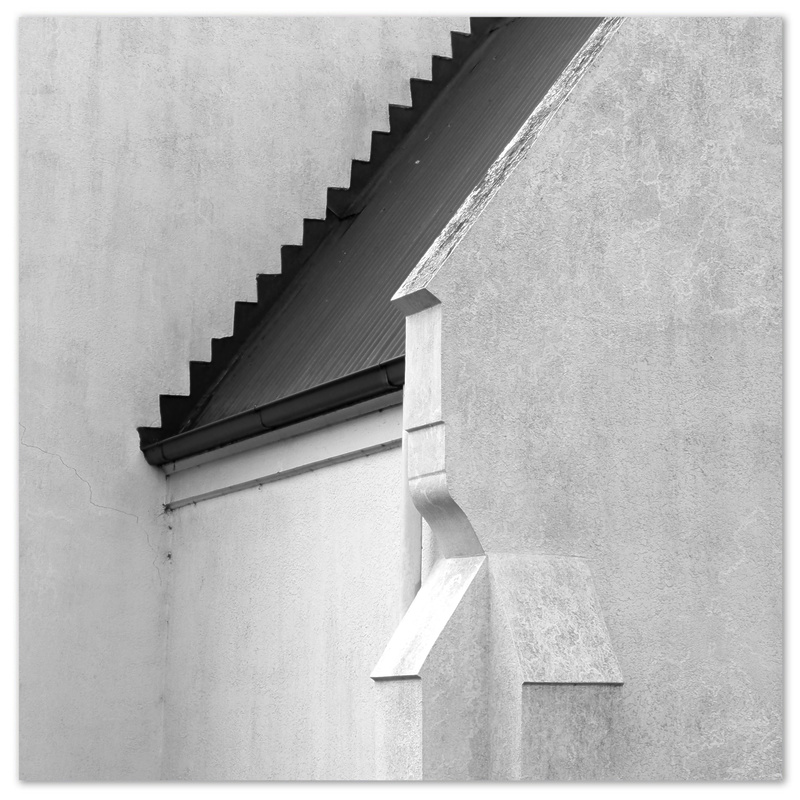 I particularly like the first image, showing the roof detail above the foyer. 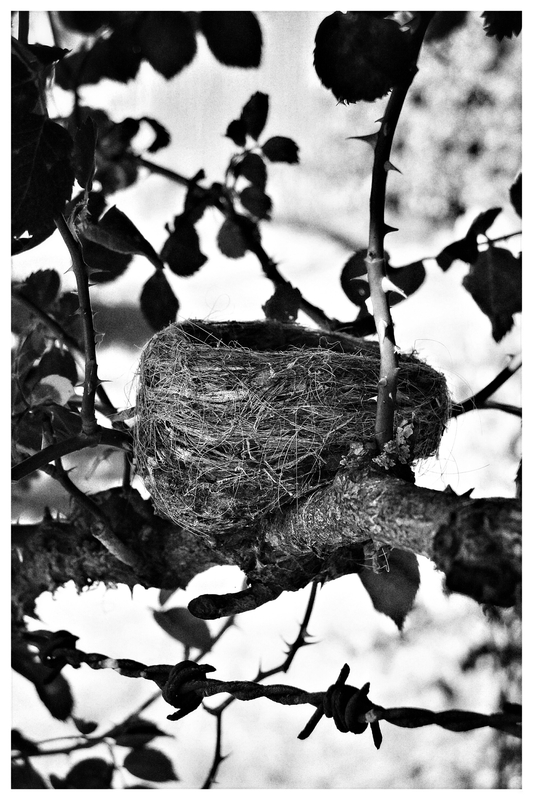 The photo of the nest, below, is untouched. What are your tips for using your camera’s monochrome settings?